Prices are fixed and mentioned along with each product. You can ask for Prices of the products where prices are not mentioned. No Negotiations please. Our prices are very competitive; nonetheless no comparisons can be made with other sellers and online shops. All the prices are either quoted in US Dollars, Euro or in British Pounds. By default, it is in INR or in US Dollars only. Though we accept most of the listed currencies of the world, but you can ask for the prices in your currency also. We accept all major currencies of the world. Payment: All International Payments are routed through our CC Avenue Payment Gateway, Western Union Money Transfer, Money Gram, Xoom or Telegraphic Transfer / Swift Code Bank Transfer only. Domestic or National Payments can be routed through our CCAVENUE Payment Gateway / Online Bank Transfer / Cheque / Demand Draft / ATM Drop Box / Cash. You acknowledge and agree that Rudraveda reserves the right in its sole discretion, to change the Fee Schedule/Prices of any of the products and services at any point of time without any prior notification. Any change in the total cost price of goods and services provided at the time of the order can be a result of fluctuations in the product price or in foreign currencies or its exchange rate, which is acceptable. Ordered products are shipped as per the shipping address provided by the buyer. We will not be held responsible (if the address provided is wrong by the buyer) for non-delivery / delay / non-collection / misplacement of the products shipped or failure to receive the shipment due to non-availability of the client at the given address. Similarly all custom related issues have to be taken care of by the client himself. We will not be responsible for any custom clearance/non clearance of goods. We can assist our clients till FOB Delhi. Buyer has to pay the custom duty, if any, at the country of his residence. Any custom clearance charges levied in India due to issues arising out of nature or price of the product is to be paid by the buyer only. Seller is not responsible if the parcel is damaged, stolen, lost or broken during transit. All goods are shipped on FOB Delhi basis only. Pictures shown in this website are digitally enhanced and/or are CAD/CAM pictures. Slight variations in terms of texture, color, appearance and feel are completely acceptable. 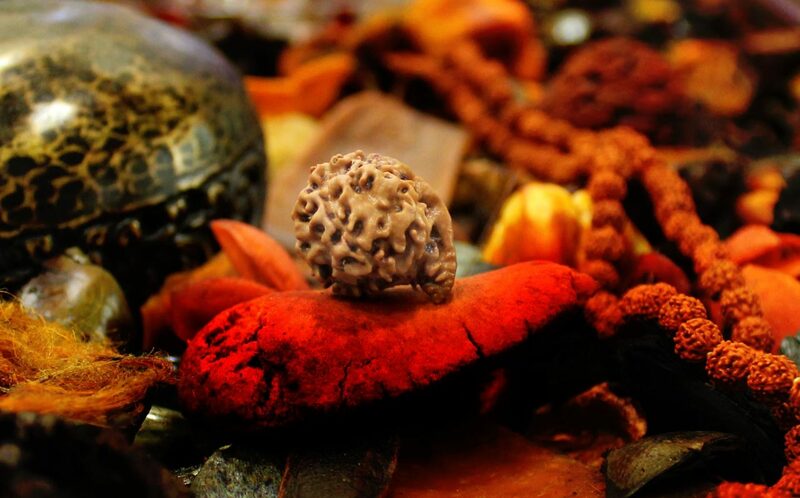 All rudraksha capping, ring and lockets are handmade and handcrafted by finest artisans. No two pieces of same design are same due to this handicraft and handmade constraint. All pictures of gems, rudraksha, jewelry and other products shown are completely indicative. The final product supplied may be different in color, texture, shape, weight and size as all rudrakshas are natural beads, gemstones, puja items and jewelry also vary. No two pieces of particular category are same. All gemstones used are natural gems, unless other than specified, which may vary in color, texture, cut, caratage, shape, clarity, inclusions and phenomenon. Shape and design of the products and jewelry may also vary slightly from computer generated and photographed images. This is acceptable. We don’t accept returns at all. All our goods are pre-inspected and quality checked at various stages before leaving the dispatch facility or the warehouse. There is no possibility of returns, as we don’t have any return policy for our products and services. We don’t entertain reasons of any sort or nature for returns as these are natural products and we take utmost care to reject any defected or unacceptable product at the sourcing stage only. Order once placed cannot be cancelled/exchanged in any case and no refund of the amount can be made.What you get is a premium quality product pre-inspected and checked at various stages of processing your order. Be sure of every constraint before ordering our products as our focus always remains on delivering quality at every possible level. Processing & Delivery may get delayed due to many reasons occurring out of unavailability of goods, strikes, health hazards, lock-outs, political disturbances, civil unrest, heavy rains, hindrances due to supply of electricity, water and labor problems, natural calamities, other unforeseen circumstances etc.. We expect our clients to co-operate for the same. At Rudraveda, terms and conditions can be amended at any point of time without any prior notice. All orders are accepted on the understanding that you have agreed to the following terms and conditions mentioned here. We accept orders on 100 percent advance payments and/or payment in full basis only. It is your responsibility to give accurate information when placing your order. Asking for a return/exchange after the delivery will not be entertained at any cost or in any circumstances. Any mistake from your side will make you liable for the same. So please be sure of what you need before ordering a product or services. In case of any misunderstandings or errors, please feel free to get in touch with our after sales team and we will try our level best to resolve the matter in your best interest. Please contact RUDRAVEDA without any delay if you have any problem with products and services supplied. However, no claims can be made and no complaints in this regard can be lodged in any country worldwide. Otherwise, it will be considered NULL & VOID. While buying any Rudraveda (www.rudraveda.com) product and services, you (as a user/client/buyer/member/subscriber) are automatically legally bound that you are agreeing to use our services in a manner consistent with the terms and conditions of this agreement and with all applicable laws and regulations in the interest of Rudraveda, i.e. www.rudraveda.com in all respects. It is by default presumed that you agree to the terms and conditions described herein (terms and conditions). Rudraveda is not responsible for any kind of side effects or negative effects of any of our services or products supplied/sold/used by the buyer/client/member/subscriber, as it is on sole discretion of the customer to use or utilize our product or services. Similarly if any astrological/puja/spiritual/ritual product/advice/service may or may not provide the desired results, we will not be held responsible for the same. All precious gemstones, on demand, will be lab tested & certified by reputed gems testing laboratory in Delhi at the very time of procurement to make sure its authenticity. You can request a Certificate of Authenticity from RUDRAVEDA on the purchase of any premium rudraksha bead and or gemstone. “RUDRA”, “RUDRA-The Tears of Shiva”, “Rudra-Vedic Rudraksha”, “Rudraveda” & “www.rudraveda.com” are the Copyright & Trademarks of Rudraveda only. Any usage of these trademarks without any prior permission will be considered as a legal offence. All the products sold at RUDRAVEDA are very precisely sourced and hand-picked after very stringent & rigorous quality checks. Our products and services are known for its superiority and un-debated excellence. We don’t compromise in quality as our target buyers are very high niche clients. We also export very high quality premium products from last 21 years. Though prices are not negotiable, we expect and entertain serious queries only. Our global presence has already made a mark as a brand called RUDRAVEDA. If you are looking for any inferior or cheap quality products, then you will be discouraged as we don’t deal in such sub-standard, mediocre or low-grade products. Do visit us for quality, rare and genuine authenticated gemstones, rudraksha beads, astro religious spiritual puja products and traditional indian jewelry. RUDRAVEDA is a one stop online shop for anything & everything related to certified rudraksha beads, gemstones, rare spiritual puja products and gold & diamond jewelry. We deliver worldwide except Africa, Russia & Brazil.